One of the eeriest thrills is drifting over a swarm of sea nettles. They pulsate slowly, caught in a unseen current. I usually encounter them while kayaking across the open mouth of the harbor on my way to sheltered kelp beds. 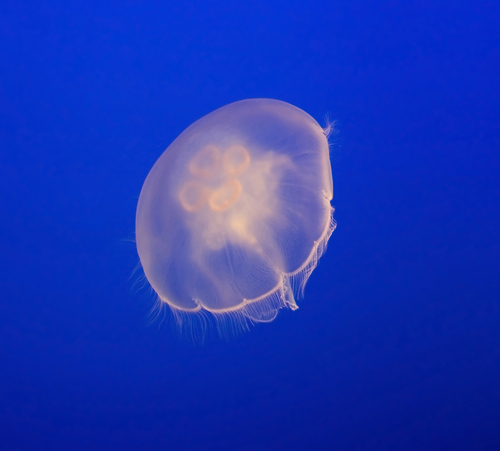 The golden-brown jellyfish have white oral arms and maroon tentacles that can reach 15 feet. Part of my fascination is their delicate beauty and part is knowing that they sting. Sliding over them in my kayak, I’m safe, but if I were to drop into the water, I know what’s waiting for me — a painful embrace. Jellies (a more accurate term than jellyfish or jellyfishes) haven’t always enthralled us in this way. When I was growing up, they were blobs on the beach that we poked with sticks and avoided stepping on. In my lifetime, however, the perception of jellies has changed radically from infamous to fabulous largely because of exhibits at the Monterey Bay Aquarium. The work displaying jellies started before the aquarium’s opening in 1984. Due to the efforts of then-in-house researcher Freya Sommer and the exhibits design team, the aquarium first displayed moon jellies successfully and artfully in 1985. (Disclaimer: I was an aquarium staffer at the time.) No one who viewed that exhibit ever saw jellies the same way again. With more R&D the exhibitions blossomed, each offering new and dramatic views of these water-worldly beings. Jellies on exhibit reached a climax, in my opinion, with the dramatic dance of the sea nettles in the aquarium’s Open Sea (aka Open Ocean) gallery, renovated in 2011. It’s probably one of the most photographed aquarium exhibits in the world. Their current unique presentation is The Jellies Experience (although not one of my favorites), a special show due to remain open until September 2014. As a result of the aquarium’s efforts and shared results, awe-inspiring jellies’ displays are common worldwide and we now appreciate the artful danger these animals possess. Jellies have been noticed more in the ocean, too, with reports of larger jellies and more massive blooms off Japan, Hawaii and elsewhere raising alarm that jellies are taking over. One recent study (Roux et al. 2013) attributes “jellification” of marine environments to the overfishing of small pelagic fishes. But, another study (Condon et al. 2013) that reviewed reports of jellies’ abundance from 1790 to 2011 concluded that jellies (gelatinous zooplankton) had not significantly increased over that time period. Researchers did find a weak statistically significant increase since the 1970s, but considered that part of natural global oscillations. They concluded no takeover. 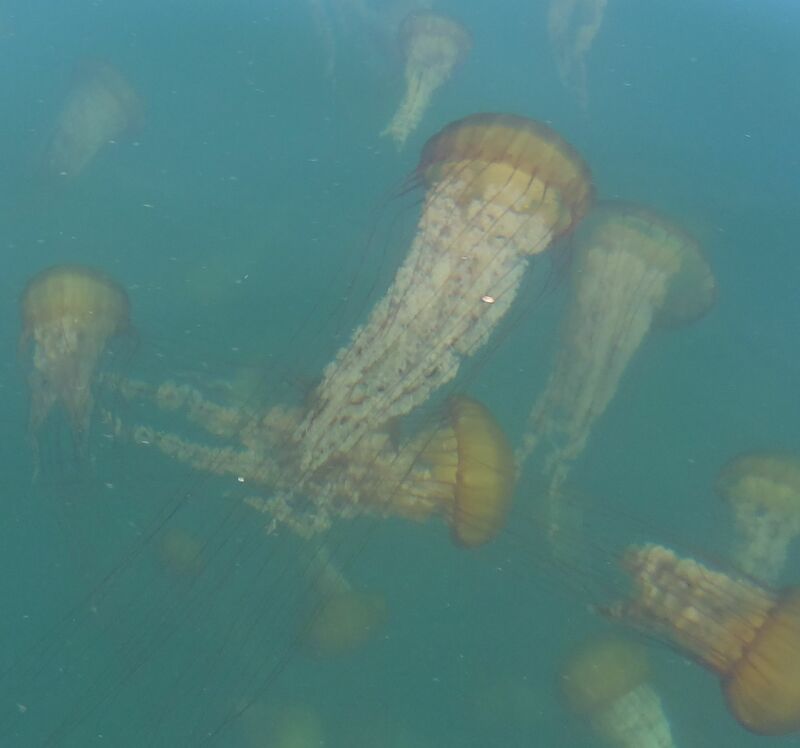 Jellies have become a favorite of mine and I watch for them whenever I kayak. I’m always delighted when I drift across these regular bay visitors. The sea nettle (Chrysaora fuscescens) is the jelly that I see most often and in the greatest numbers. They remind me of floating Tiffany lamps, especially when caught upright in the kelp. The translucent bell grows to 12 inches (30.5 cm) and the trailing tentacles to 15 feet (4.5 m). Stinging cells (nematocysts) on the tentacles catch fish eggs, small fishes, plankton and other jellies. The white oral arms start digesting a meal before it reaches the jelly’s mouth. I’ve paddled over swarms (also called smacks) filling the water for as far as I can see, most often from late summer into winter (August thru January). Sometimes along with sea nettles are moon jellies (Aurelia sp.). The name is apropos for this moonlike 16-inch (40-cm) globe that lacks the long trailing tentacles of other jellies. Instead it has many fine tentacles on the bell’s edge and mucus is the weapon it uses to collect tiny zooplankton. Looking at the translucent bell you can usually see four white horseshoe-shaped stomach pouches, and a bit of purple, which are the gonads. I was amazed to learn recently that during their sexual reproduction phase of life (they have an asexual phase too), females may carry fertilized eggs and larvae instead of just releasing eggs into the water (a beautiful photo shared recently by JellyBiologist shows a female with eggs). I find moon jellies most often in late summer and early fall (August thru November), although they’re here at other times, too. 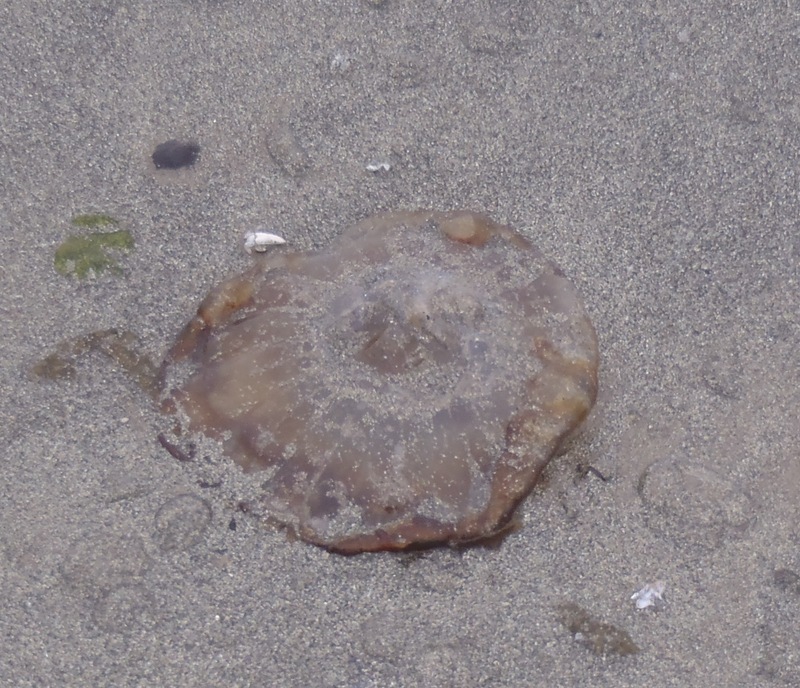 The bay jelly that looks least like a true jellyfish is the disheveled egg-yolk jelly (Phacellophora camtschatica). It looks like a cracked egg dropped into water and doesn’t hold its shape well (although ones I’ve seen farther offshore are more put together). 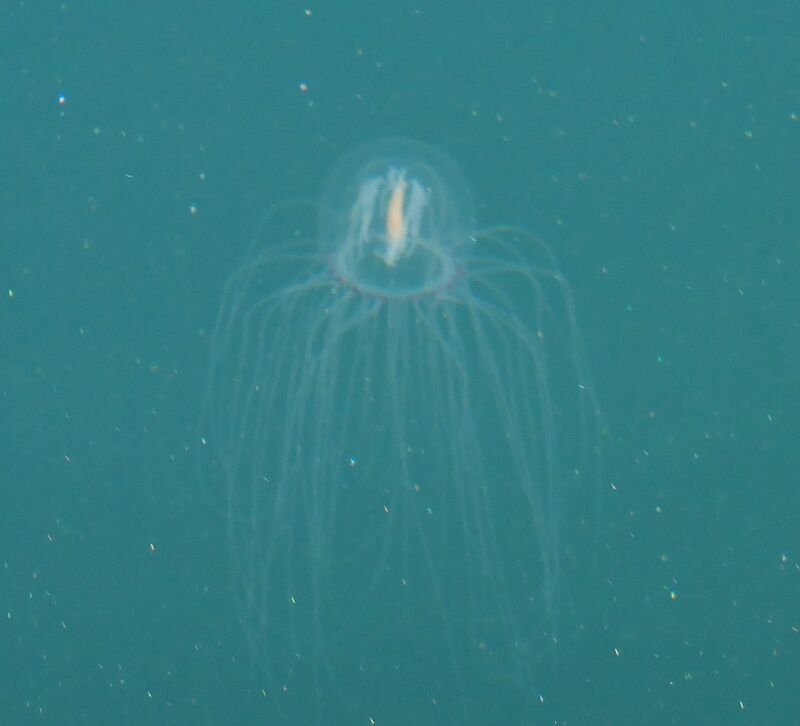 This jelly is a slow drifter and appears harmless, but below a bell that can grow to 24 inches (61 cm) are stringy tentacles extending up to 20 feet (6 m). Using this drift net, it captures food, mostly other jellies. The tentacles are sticky and have a mild sting (just enough to snag a meal, not subdue it). The bright “egg-yolk” mass is gonad tissue. I usually see a few of these in late summer and fall (August thru November). 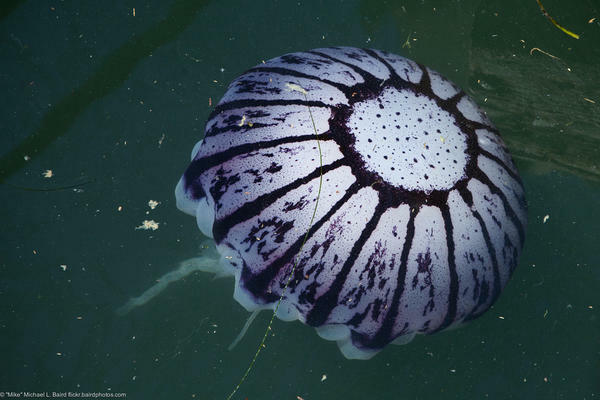 The purple-striped jelly (Chrysaora colorata) is the least common of the jellies I see on my kayak trips, but easy to identify based on the adult’s size and distinctive purple stripes. 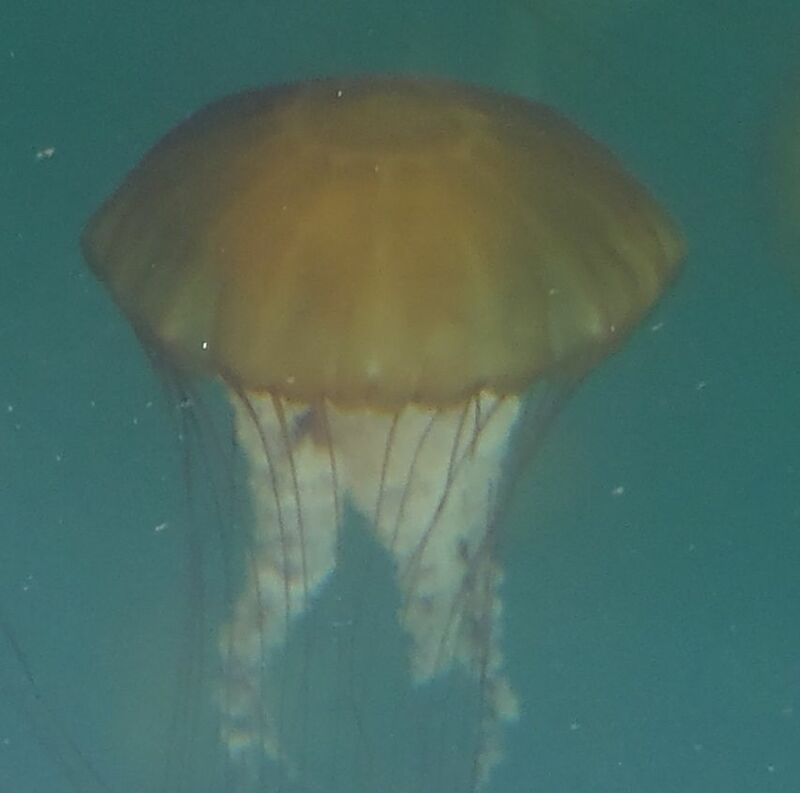 This jelly has a large round bell to 28 inches (70 cm) in diameter, long whitish oral arms (more prominent in young animals) and trailing stinging tentacles that hurt. 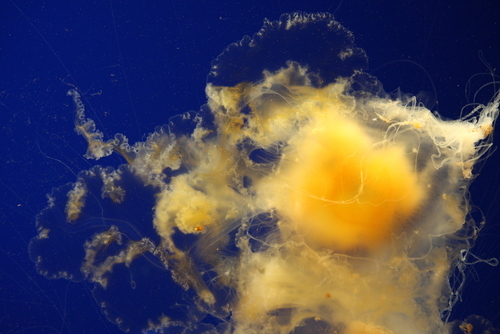 They use their tentacles to capture zooplankton including fish eggs and larvae, other jellies and jellylike animals. The few sightings I’ve had have been in the fall (October and November). In January of this year I was delighted to meet a new species (new to me). While paddling away from the beach one morning, I noticed very small jelly-shaped forms floating by me. I discovered they were bell jellies (Polyorchis sp.). This delicate-looking species lives in bays and harbors near the bottom where they use their many tentacles to sting and capture small crustaceans (shrimps and the like) for food. They’re easy to overlook, except of course if you’re a shrimp that’s been zapped. I was enthralled to just sit and watch these creatures glide by me. What this March trip taught me was that I shouldn’t focus on only the big stuff — sea nettle swarms, barking sea lions and grooming sea otters. I can be amazed by the little stuff, too, when I slow up and take the time to look down. Condon, R.H. et al. (2013). Recurrent jellyfish blooms are a consequence of global oscillations. PNAS 110: 1000-1005. Roux, J-P., et al. (2013). Jellyfication of marine ecosystems as a likely consequence of overfishing small pelagic fishes: Lessons from the Benguela. Bulletin of Marine Science 89(1): 249 doi: 10.5343/bms.2011.1145. Study summarized in Science Daily, May 3, 2013. Campbell, E. (1992). A Guide to the World of Jellyfish. Monterey, CA: Monterey Bay Aquarium. George, T. C. (2000). Jellies: The life of jellyfish. Brookfield, CT: The Millbrook Press. Wrobel, D. & Mills, C. (1998). Pacific Coast Pelagic Invertebrates: A guide to the common gelatinous animals. Monterey, CA: Sea Challengers and Monterey Bay Aquarium.